Hello everyone! 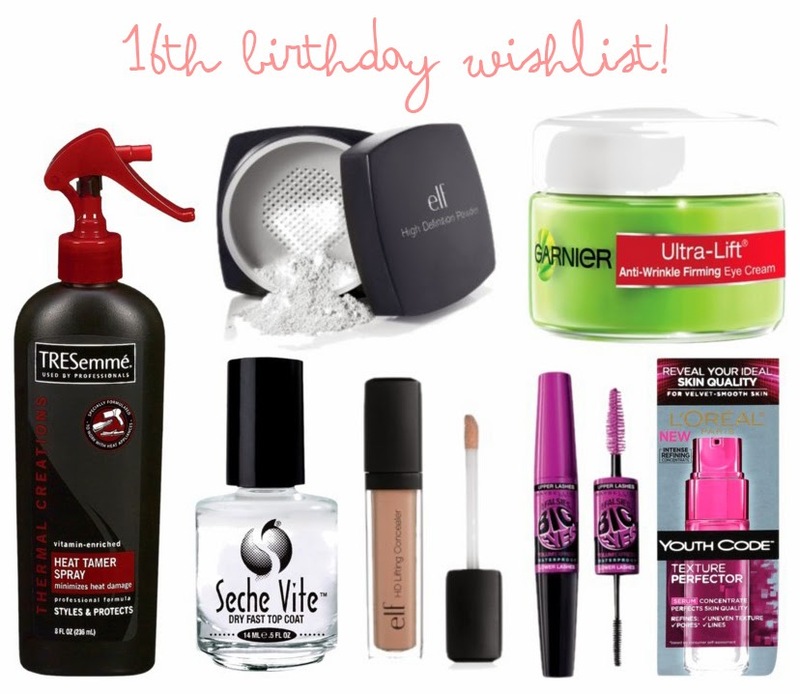 If you don't already know, my 16th birthday is this Thursday ^_^ Which is a huge step up to becoming an adult, but I am still a little kid at heart ♥ Anyways, my friend has been pestering me to make a blog post of some items I want for birthday. I am happy with anything and only if they show up to my birthday party. This years theme is costume part, fun, right? Believe it or not, I have never used a heat protectant on my hair in my entire life. You must be thinking, 'Woah, your hair must be nasty.' It really isn't because I hardly ever straighten or curl my hair. Tresemme Heat Tamer Spray is a popular heat protectant with many good reviews, affordable too! Makeup wise, I would like the E.L.F HD Powder to use as a setting power because many other powders are pretty cakey. I also would like to the E.L.F Lifting Concealer which is probably a knockoff of the NARS radiant concealer. Another makeup product is would like to see in my collection is the Big Eyes Mascara by Maybelline. I think it is so cute and I like the lengthening effect I have seen in reviews. Do you have a Weibo? Wishing you an early happy sweet 16th!! I love the Tresemme heat tamer. It's the best i have tried so far. Happy early birthday! :D OMG 16. I feel old. Oh HAPPY BIRTHDAY hun, I hope you have a great day and get all that you want. I got a car when I turned 16 complete with a sound system put it in by the guys my dad knew at this award winning audio design place!